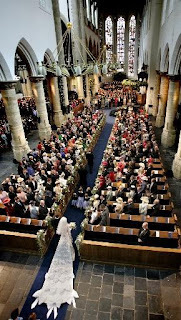 Goodness me, our little digression into the wedding gown of Princess Mabel in last week's comments spawned an immediate outpouring of Wedding Wednesday requests. Well, I don't blame you. If you've never seen it before you really can't comprehend it in a single glance. So here you go, kids: Bows Gone Wild, starring Mabel van Oranje. When Mabel Wisse Smit married Queen Beatrix's middle son, Prince Johan Friso (who preferred to be called Friso) in 2004, she turned down conservative designs from the Dutch design duo Viktor & Rolf and requested they make her something "memorable" (mission accomplished). She's not a conventional girl, this one, and stated herself that she was never the little girl with wedding dress dreams. The end result is actually a very flattering silhouette in snow white double-faced duchesse satin with a bateau neckline, long sleeves, and a flared skirt leading to a 3.15 meter train (10 feet 4 inches - including the bows, of course). She topped it with a short veil and a diamond sunray tiara. The tiara's large diamonds are borrowed from the Dutch Sapphire Tiara. I find it somewhat, erm, pokey in a photograph, but in movement it works. The huge diamonds capture every last possible bit of light. The tiara itself has a rather two-dimensional effect; it almost seems like a fairytale illustration of a tiara come to life to me. But none of that matters, really, because what you want to talk about right now are the bows: 248 of them, to be exact. Yes. Two hundred and forty eight. That's 128 bows for the skirt, 85 on the bodice, and 35 on the train. All handmade from crepe georgette (no wonder the thing took more than 600 hours to make), and symbolizing longevity, commitment, and permanence. 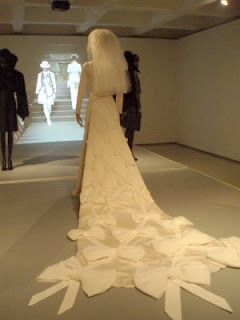 Placed on a trelliswork background, they cover every single part of the gown, growing gradually in size from the neckline to the hem and then catching a serious case of gigantism on the train. The pattern covers the seams, so it looks like the gown is cut from a single piece of cloth. 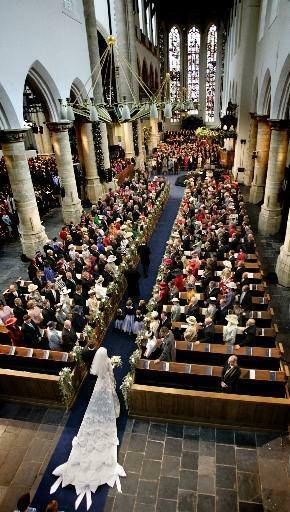 Friso married her anyway, obviously, and lost his place in the Royal House and in the line of succession. 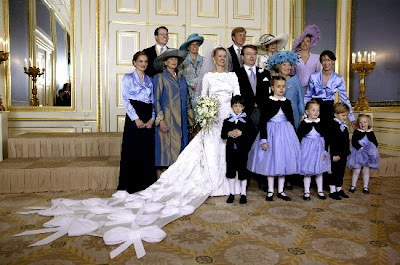 I'd say that the bows were an attempt to create a bigger story than the scandal on the wedding day, but she's kept up a string of eyebrow-raising Viktor & Rolf creations in the years following...so, this is just her style. That style, including the notorious bowfest, is entertaining for sure, but also overwhelming. 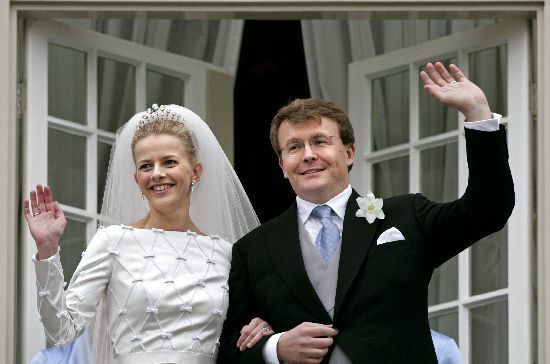 Princess Mabel and Prince Friso had two daughters, Luana and Zaria, before Friso was tragically buried in an avalanche while skiing in Lech, Austria in February 2012. He was in a coma until he died of complications from the accident in August 2013. Princess Mabel continues in her work as a human rights activist - work she's been doing since before she married Friso - and has worked with The Elders and Girls Not Brides. Mabel's dress: fun and quirky or way too much?